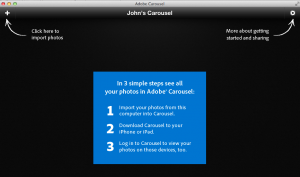 Adobe Carousel is a new paid subscription photo catalog, sharing, and editing service that works between a user’s Macintosh and iOS devices. For this first look Nemo Memo introduction, I tested Carousel on a pre-unibody MacBook Pro Core 2 Duo and an iPad 2. Here is Adobe’s FAQ web site explaining Carousel and its pricing. Macintosh OS X 10.7 Lion is required. For best results, upgrade your iPad to the latest iOS. Both of the above are available from Apple’s App Store. Carousel downloads are free, and installations are effortless on both computer and iPad. I first installed Adobe Carousel on my computer, launched it, and clicked on Getting Started. Then I logged in with my existing Adobe ID. You must create one if you don’t already have an Adobe ID. I then enrolled in a 30 day complimentary subscription, which MyMac highly recommends. I clicked on Learn More, then on What Is Adobe Carousel, then on More About, and then on Help, to learn as much about Carousel as possible. 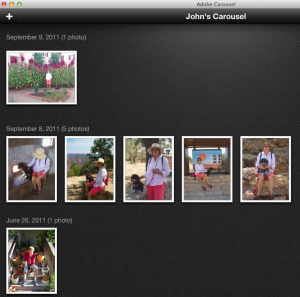 Next I installed the iOS version of Adobe Carousel onto the iPad 2. All the interface screens are identical from iPad to Macintosh. Adobe has done a nice job with consistency of the user experience. 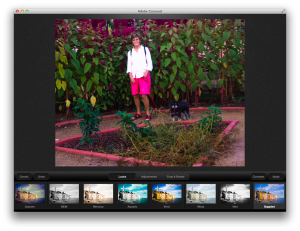 Back on the MacBook Pro, I clicked on the plus sign upper left to import photos into Carousel. I navigated to a folder of images I had placed on my Desktop, and then I clicked Import. Thumbnail images of my chosen photos, all of them, from the source folder appeared almost instantly in my John’s Carousel black window, organized in tiers by date the photos were taken. 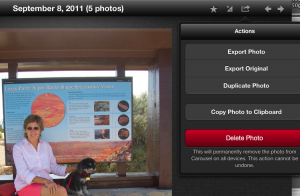 A few seconds later the same photos appeared in the same presentation on the iPad. I double clicked on an image thumbnail to open a photo. Several buttons appeared upper right in the Adobe Carousel interface. I added a star to the first photo. I clicked on a little plus/minus symbol to open up the Looks sampler of pre-set enhancements. This is where all the editing takes place, using Looks, Adjustments, and Crop & Rotate, all underneath the active image being edited. Clicking on Compare provides a handy before/after glimpse of how the latest edit looks relative to how it had been. Clicking on Apply locks in the edit, and Undo removes the edit. You will spend most of your editing time in Adjustments and Crop & Rotate. Both of these editing areas have multiple ways of improving or ruining your precious photos, so take your time exploring within them. 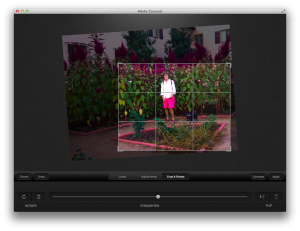 An Actions pane provides opportunities for image exporting, duplicating, copying, and deleting. 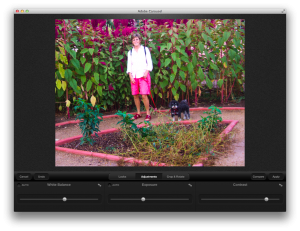 Full screen viewing and usage of Adobe Carousel is available from an angled double arrow. I switched back and forth several times between Mac and iPad. The user experience is so similar that I quickly became familiar with Adobe Carousel on both devices. For example, the different preset Looks are viewed horizontally by swiping sideways on the iPad, and by mousing or swiping sideways using Apple’s Mighty Mouse or Magic Mouse. There does not appear to be an Undo possible once a photo edit has been applied. I will check with Adobe and update this article, as appropriate. 1. 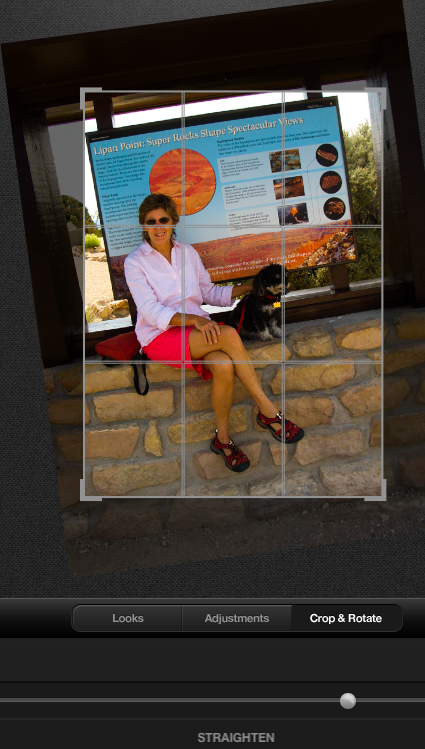 On your Mac, double-click any photo you’ve edited to see it in Loupe View, and click the icon to enter Develop mode. Then right-click or Ctrl-click the photo and choose Revert to Original. Native display color balance and presence differs between MacBook Pro (and every computer) and iPad. 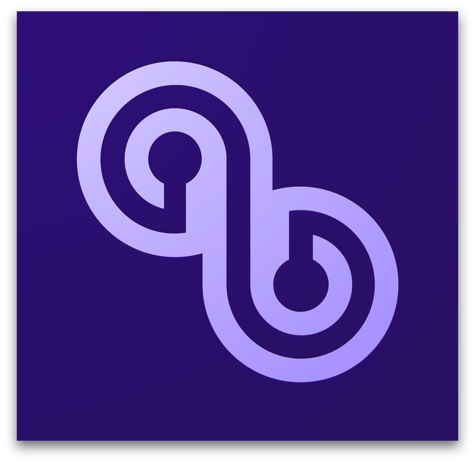 For professionals and prosumers this may be a concern, but for Adobe’s intended Carousel customer base this will be of limited inconvenience, relative the magic of multi-device image sharing. MyMac will have future coverage of Adobe Carousel. For now, it is easy to recommend the 30 day free trial to help you decide if the monthly or annual payment plans are worthwhile. Like John I have also been playing with Carousel on several devices, including my Mac. The editing tools are excellent and the speed at which the photos appear from one device to another is amazing. However, my biggest problem is the monthly fee. There are several, maybe I should say many, apps with one time fees that have fantastic editing tools like Carousel. They do not have the cloud service of Carousel that you are paying for, but with Photo Stream in iOS 5 that can easily be mimicked by saving you photos to your photo library on an iOS device. Plus, iCloud is free! I would love to see a stand alone version of Carousel without the cloud services and a one time fee. That would be great.